The DAV Van Service is a volunteer program that provides transportation for Veterans to the Butler VA Hospital, the Pittsburgh VA Hospital, and the Lawrence County VA Clinic. The van leaves from the Lawrence County Government Center and depends on the volunteer drivers’ availability. You MUST contact the number (724-477-5010) to schedule transportation. Please call two weeks in advance to plan a ride. We are looking for dependable to be drivers for our van service. This is a volunteer program. All volunteers must be screened at the Butler VA Medical Center. 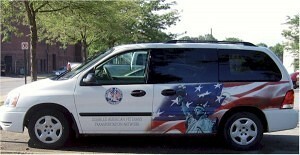 Contact our van service (724-656-2180) or stop in at the VA office for an application.